Time for another Vivel Free Sample. 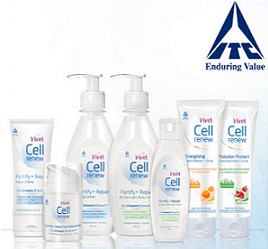 Get Vivel Cell Renew Free Sample and 250ml body lotion by ITC for free. Vivel has been built on the philosophy of delivering superior functional benefits with strong differentiated propositions. Vivel seeks to stay relevant to the evolving Indian consumer by offering her greater value through product and packaging innovations. 3. Recommend Cell Renew to at least 3 of your friends. Fill in the form along with a personalized message for them. Vivel will deliver a Vivel Cell Renew Free Sample to your friends along with your personalized message. It will also send you a 250ml body. Vivel has recently launched a carefully crafted skin care solution that helps renew skin cell by cell. Vivel Cell Renew is powered with 10x benefit of active tocopherols. It performs a dual action of repair and fortification for holistic skin care. The advanced formula repairs the damaged skin cell barrier. It replenishes lost nutrients but also fortifies skin’s natural defences against free radicals and other environmental factors. The rich texture of Cell Renew penetrates to a deep cell level without leaving any sticky residue. Its unique formula works deep within the surface to repair the skin’s natural barrier. Vivel Cell Renew Free Samples gives users way to use them for free. This is an ultra rich, deep penetrating body lotion to relieve stresses of daily life. Its super absorbent formula moisturizes and nourishes skin and adds a luxurious sheen to give soft, smooth and healthy skin. The new Fortify + Repair Hand Crème from Cell Renew is infused with skin conditioning agents. Cell Renew Pollution Protect Cleansing Cream + Scrub detoxifies your skin. Cell Renew Energising Face Cleanser + Scrub rejuvenates your skin. Thanks today I had received the Free sample from Vivel body lotion, Thanks once gain.